Mr. Clark was preceded in death by his wife, Daisy Clark; children Elnora C.Graham and Brenda Clark; parents, John N. and Mary Kate Clark; sisters, Lula Mae Henigan, Katie Lee Fleeting and Elouise Clark; brothers, Woodrow Clark, Thurman Clark, Andrew Clark, Arthur Clark, Thomas Clark and Walter Clark. Alex worked most of his life as a farmer in Hoke County. He labored in the fields during the week and spent weekends cutting hair. He would cut hair all night, spinning tales, sharing laughter and of course his favorite past time was to debate the Bible. Like most during that era, he was not able to complete school. Everyone was expected to work on the farm. He was sharp, intelligent and could calculate numbers in his head better than college graduates. After retiring from farming, he worked at Burlington Mills for 15 years. He had an outstanding work ethic and continued to have his own lawn care service for an additional 15 years. He leaves to mourn his son-in-law Zebedee Graham; grandchildren, Zebedee Taylor, Alphonso, James, Alexander, Judy R. Evans, and Andrea N. Graham; seven great grandchildren and eleven great great grandchildren. 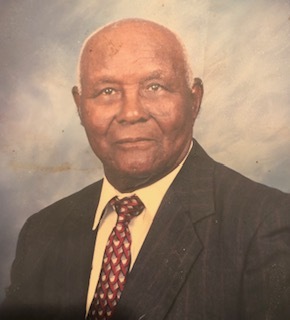 He was a member of Mount Pisgah Missionary Baptist Church for more than 80 years, and he served faithfully until his health declined. He often volunteered in doing odd jobs around the church without being asked. Alex was a proud member of the East Freedom Lodge #328 Raeford, NC for 59 years. A Mason is a life long commitment to God, church, family, and community service. WORK as he offend called it, the mortgage we pay because of the long bonds of generations of the Brotherhood.